Fluid and serpentine, this retaining wall is anything but run of the mill. Beautiful used brick face this striking wall, while rounded coping caps made from bluestone top it all off. Check out more photos below of this breathtaking wall and stairway. McGregor Lake ThinStone from Montana Rockworks (Kalispell, MT) faces this impressive ski resort cabin located at Schweitzer Mountain Resort near Sandpoint, Idaho. 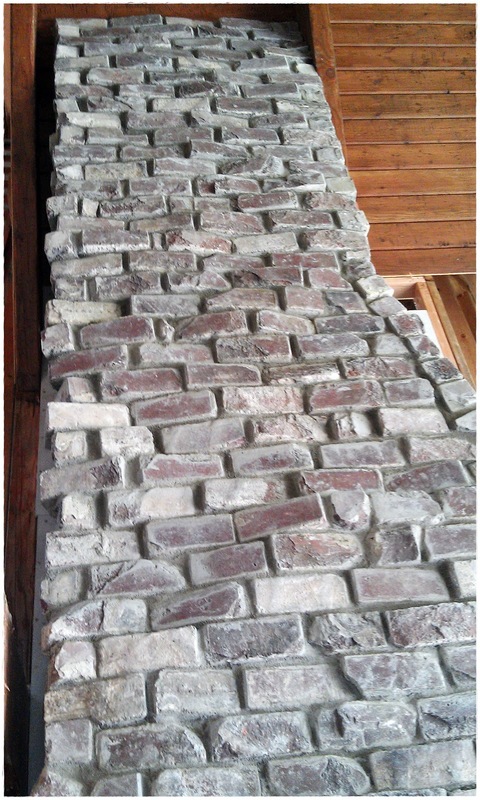 McGregor Lake was installed using 1/2" mortar joints and standard gray mortar. In business since 1974, Mastercraft Masonry is committed to delivering only the highest quality masonry installation and service. 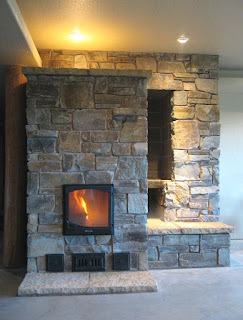 Tight fitted Montana Cabinet Gorge faces this Swedish Masonry Heater built near La Center, Washington. The Swedish design allows the chimney to vent directly from the top of the fireplace, allowing a line of symmetry not available with our standard Masonry Heater installation. Quarried nearby Montana's popular Chief Cliff natural stone, Cabinet Gorge delivers brighter orange colors, yet brings the same earthy hues Chief Cliff is known for. Charcoal mortar was used to accent Dry Stack look. 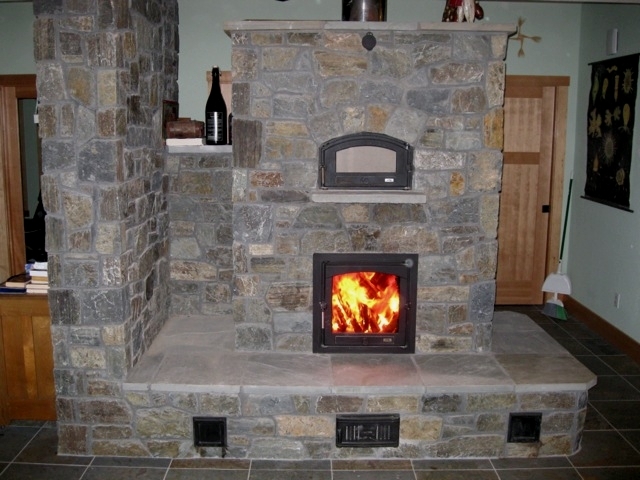 Thermaled Bluestone serves as the hearth top as well as bake oven shelf and fireplace cap. Check out our newest YouTube video of this fireplace in action! 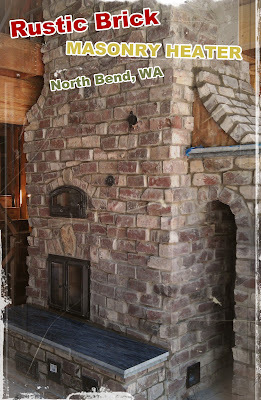 Recycled brick from the streets of Seattle's Chinatown district are facing this rustic, unique Masonry Heater in North Bend, WA. Solid soapstone serves as the hearth and woodbox ceiling / shelf. 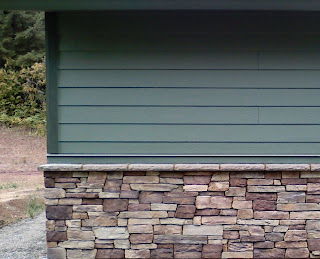 This Masonry Heater built on the Oregon Coast is faced with Loon Lake from Glacier Stone (Kalispell, MT). Ryan and Julie are thrilled with its performance, and said it has excellent draft - even from the first firing! 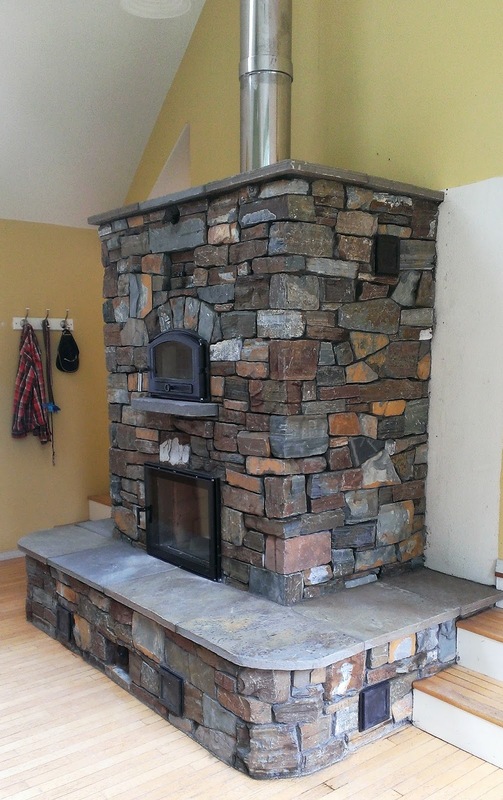 This Heater is optioned with a bake oven and heated benches, as well as a stone wall on the left of the fireplace. Now Doing Business In Idaho! 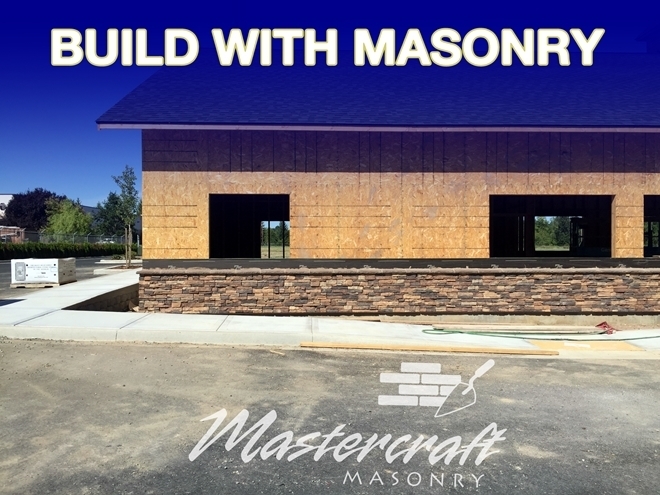 Mastercraft Masonry is now fully Licensed, Bonded, & Insured in Idaho. This expands our customer base to include all the states in the Pacific Northwest! 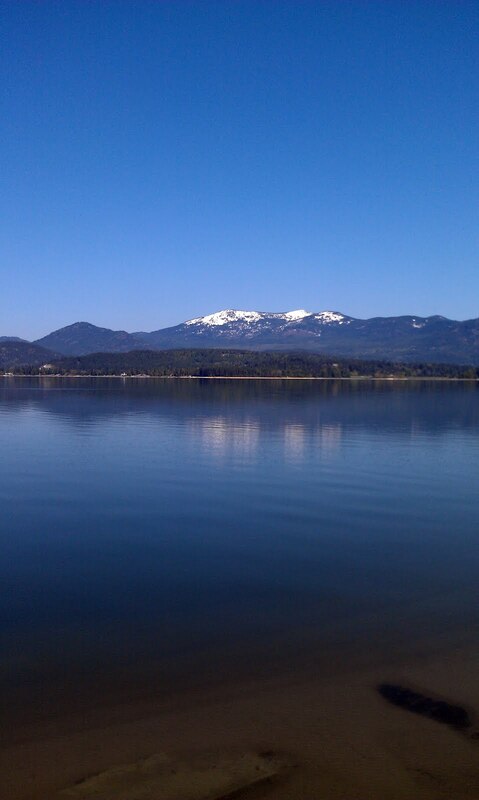 Pictured is the view from a recent job in Sandpoint, Idaho. Contact us at (360) 225-5699 for more information and customer inquiries! Our latest job was an installation of Montana Buff - similar to Montana's Chief Cliff - along with 15% Huckleberry Basalt and 15% Pritchard stone. The customers were ecstatic! 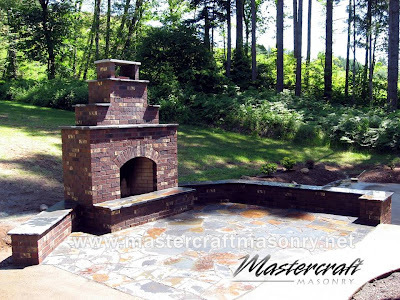 Mastercraft Masonry was established in 1974 by Stan Homola as a masonry contracting business, specializing in fireplaces. In the 1980's Stan was intrigued by a European concept of a masonry stove and built an early design of a Finnish contra-flow heater. After 25 years and over 100 Masonry Heaters built, Mastercraft Masonry offers a superior Masonry Heater core system that delivers high performance and is plenty durable to withstand decades of heating seasons. 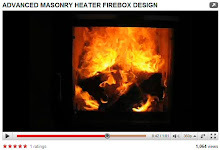 Our design utilizes a replaceable firebox, the first area a Masonry Heater can exhibit problems. Mastercraft's firebox sidewalls use ports that feed secondary air in above fuel charge. Heat exchange channels, firebox floor, capping slabs, and bake ovens are shop built, using a dense castable refractory designed to take 3,000 degrees (F). An optional new air frame door surround enhances performance of burn, air-washes glass, eliminates typical heat stress problems at loading door area and solves the issue of using a smaller door with a larger firebox. The standard core foot print dimensions are 42" wide by 23" deep. Firebox dimensions are 20" wide by 21" high to bottom of heat shield lintel. Typical footprint of finished heater including hearth and chimney is 6' wide by 4' deep by 7' high. Options include heated benches, water heating coils, and see-through fireboxes. 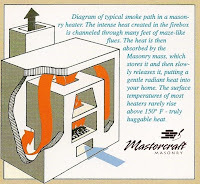 Mastercraft can also install the Masonry Heater core by itself, with instructions for facing. Contact us for more details! 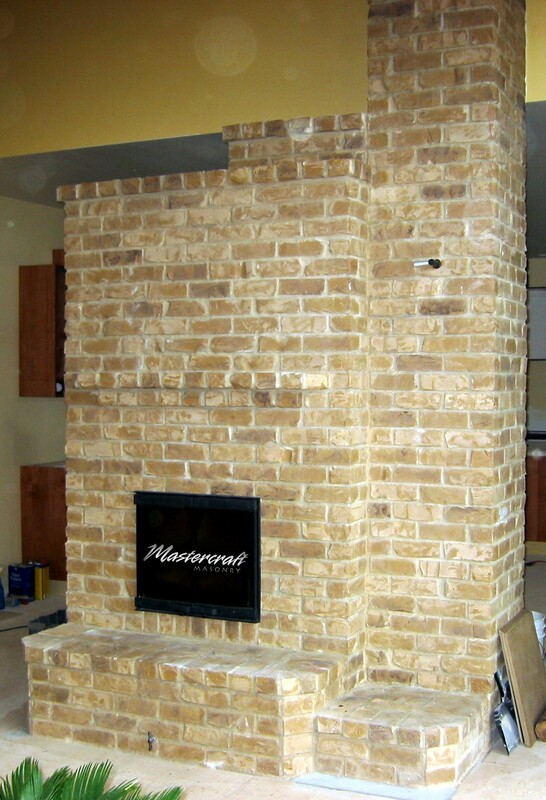 Mastercraft Masonry is a Certified Masonry Heater Installer by the Masonry Heater Association. Outdoor fireplaces provide an excellent place to wind down after a long Summer day. 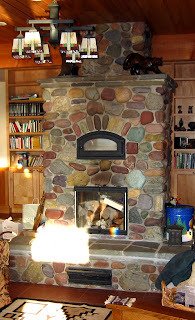 Covington brick from Mutual Materials faces this fireplace and its seat walls, while Iron Mountain flagstone serves as the caps and sandbed floor surface. Interested in creating an outdoor living space? 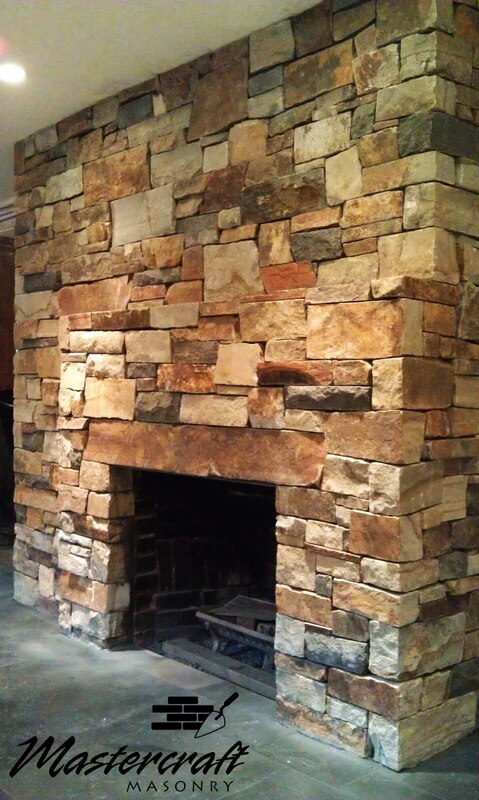 Contact Mastercraft Masonry for a free quote! Ever wonder how to drastically cut your heating bill? Have you discovered that you can heat your home for 24 hours with just one 40 lb. stack of wood? 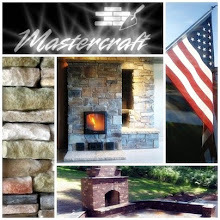 Mastercraft Masonry has the answer. Significantly slashing utility bills is one of the many reasons homeowners purchase a Masonry Heater. A family of five in Southwest Washington heats their entire 2,000 sq. ft. home and also heats their water with the fireplace - and spends just $70-80 on their monthly electric bill! 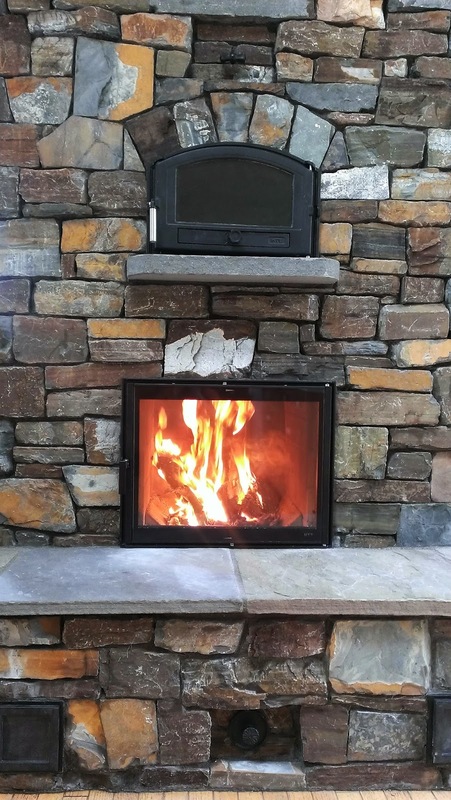 These high efficiency fireplaces consume much less cordwood in one heating season than a woodstove, and produce a short, yet powerful 1700 degree burn that significantly reduces emissions. 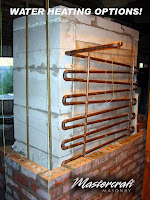 The Masonry Heater begins emitting a slow, even radiant heat, lasting up to 24 hours after all combustion is complete. Long horizontal lines define this large, contemporary fireplace in a home designed by Boora Architects of Portland (http://www.boora.com/). The stone's deep blue hues bring in the ocean view which is directly to the left of the fireplace. 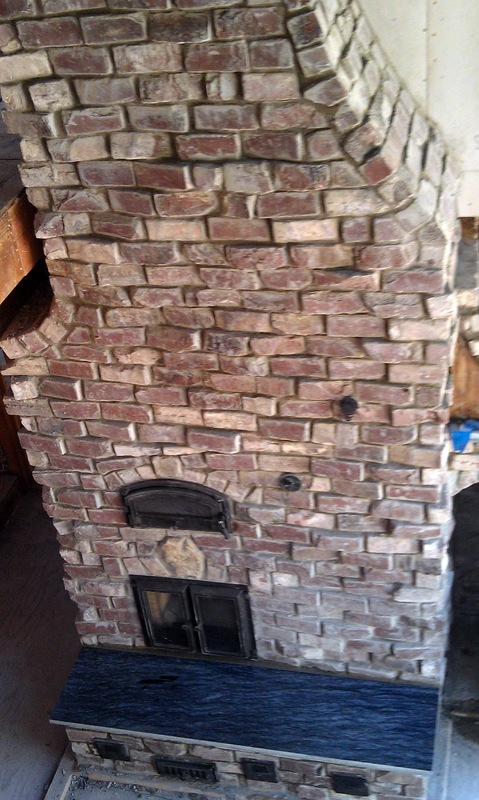 The photo pictured is the fireplace's back side, descending two stories down the stairway. 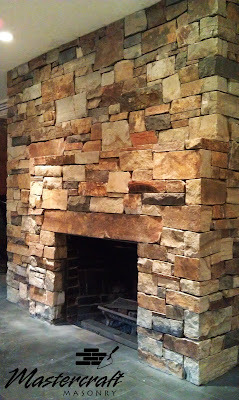 All stone on the house was cut 3" in height and varying lengths. 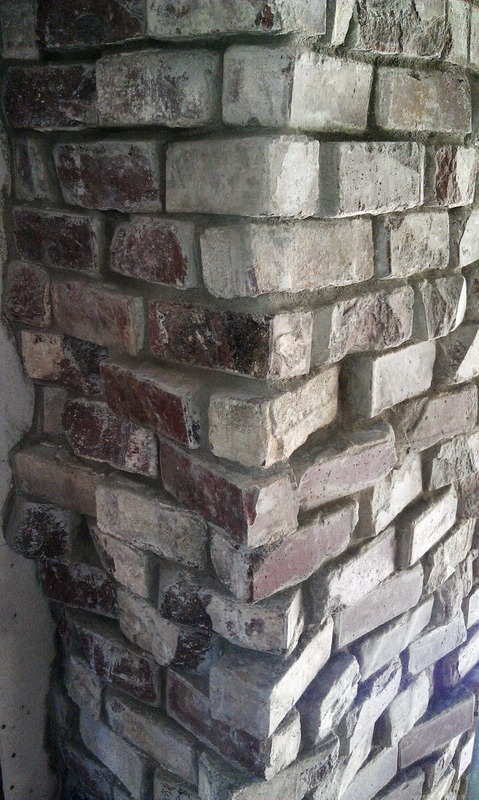 Mastercraft Masonry offers customers all types of masonry installation. Custom archways, veneer, patios, sandbed pavers and wood fired pizza ovens are among the many design options homeowners can choose from when building or remodeling using masonry! Don't hire just any mason contractor to do your projects - demand better. 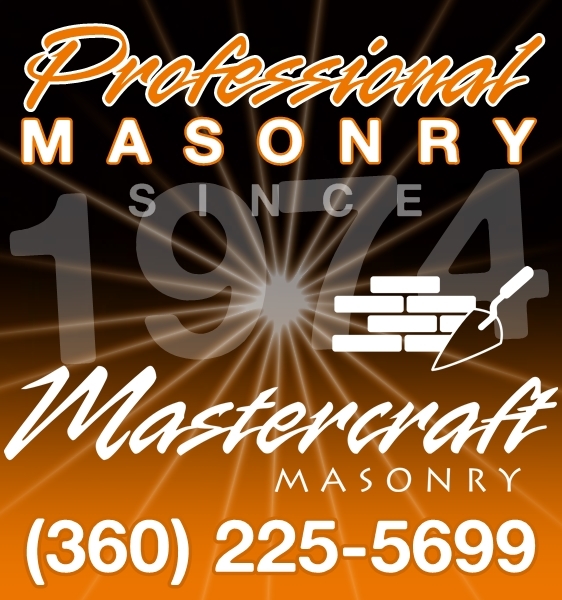 In business since 1974, Mastercraft Masonry promises and delivers high quality masonry construction projects in the NW - guaranteed. Over 35 years of experience in professional masonry installation makes Mastercraft your first choice in selecting a reputable masonry contractor. We are fully Licensed, Bonded, and Insured in all of Oregon and Washington. Call us today! Eugene, Salem, Gresham, Hillsboro, Medford, Bend, Springfield, Corvallis, Tigard, Albany, Lake Oswego, Keizer, Oregon City, McMinnville, Grants Pass, Tualatin, Willamette, West Linn, Milwaikie, Woodburn, Beaverton, Sandy...and any other town in OR! Seattle, Spokane, Tacoma, Vancouver, Bellevue, Everett, Federal Way, Kent, Yakima, Bellingham, Kennewick, Pasco, Zillah, Morton, Longview, Kelso, Enumclaw, Lacey, Long Beach, Pullman, White Salmon, Goldendale, Carson, Sunnyside, Richland, Castle Rock, Ellensburg, Davenport...and any other town in WA! How much maintenance is required on Masonry Heaters? Very little. If you're burning seasoned, dry firewood, the only maintenance is a chimney sweep / inspection every year or two. A small amount of ash may accumulate in the contraflow channels over a year's period, and can be cleaned out in the warmer months when the fireplace is not in use. What price ranges do your Masonry Heaters fall into? 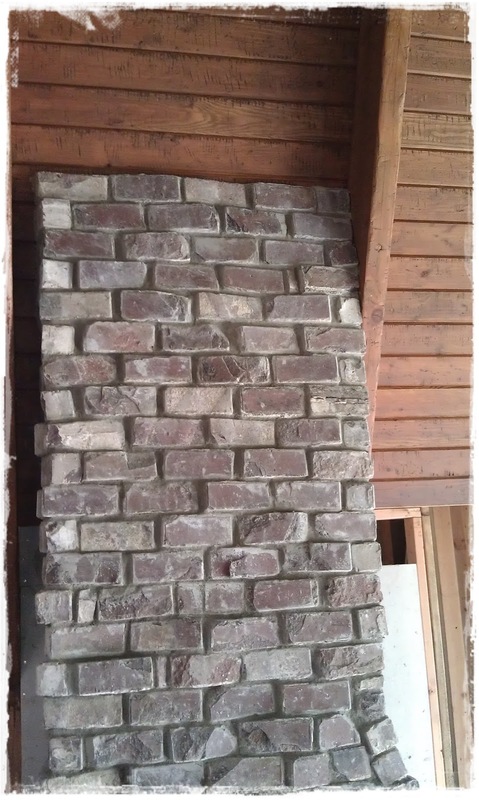 A Masonry Heater faced with a simple brick (no detail) will run about $13,000. This option uses an insulated metal chimney flues. 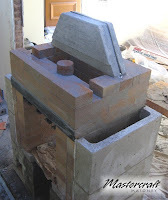 A full masonry chimney can be built for an added cost. Using natural stone and/or adding detail work with the masonry face will add to that cost. Can I burn natural gas or propane in a Masonry Heater? No! Use only the correct fuel - dry, seasoned firewood. 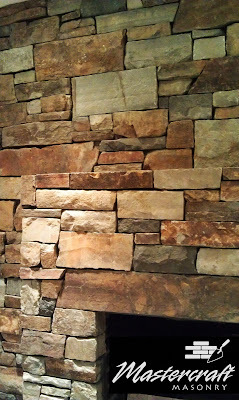 The Masonry Heater's contraflow channels can fill up with the vaporous gases and can explode the fireplace from within. How dry does firewood have to be to burn efficiently? Achieving 20% or less moisture content in your firewood is recommended to maximize the efficiency of your Masonry Heater and minimize creosote production. Do not burn wet wood, as this will create excessive creosote in the contraflow channels of the Masonry Heater and will eventually start "choking" the draft of the fireplace. Are there any safety issues with using a Masonry Heater? Mastercraft Masonry designs and installs our Masonry Heaters with sufficient drafting to prevent almost all smoke from entering into the home. As a safeguard, we recommend Masonry Heater owners to purchase a Carbon Monoxide (CO) detector to protect against the silent gas from entering your home. Every fireplace owner should have one. Masonry Heaters - when used properly - are a safe, gentle and efficient heat source! How much money can a Masonry Heater owner save on his power bill? We installed a Masonry Heater for a customer who had a larger family, and they opted for the water heating elements. They are saving approximately $100 a month in electricity costs! Does a Masonry Heater fit into the sustainable living lifestyle? Absolutely! Since no electricity or fossil fuels are used, and the Masonry Heater efficiently uses its 100% renewable resource fuel, Masonry Heaters are an excellent way for homeowners seeking a LEED certified home. Installing one can possibly gain you LEED credits! Masonry Heaters can significantly reduce your dependence on the power grid when outfitted with either a baking oven or water heating elements! 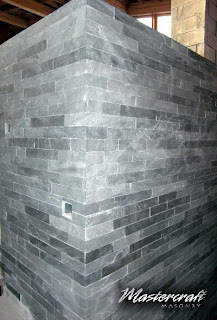 Do you guys install soapstone fireplaces (Tulikivis)? 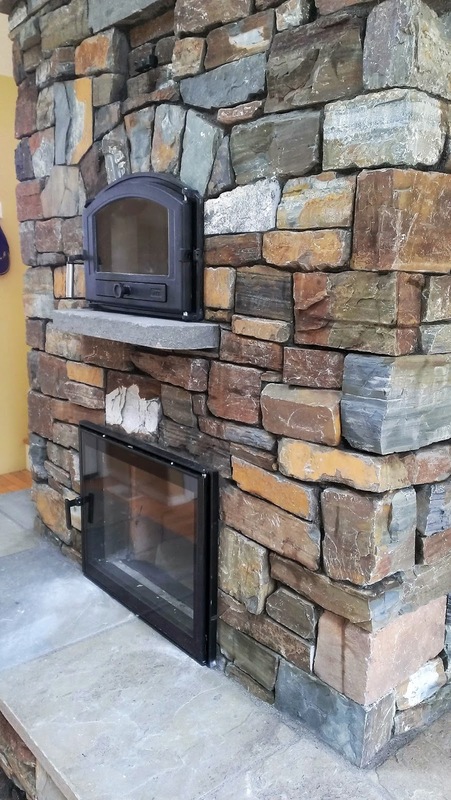 Yes, we have installed several of the smaller-scale soapstone fireplaces. Stan was in business with another company to import and sell the "Kivia" brand soapstone fireplaces - but soon got bought out by Tulikivi Corp., of Finland. If you have one of these fireplaces we can give you a quote on a professional installation! 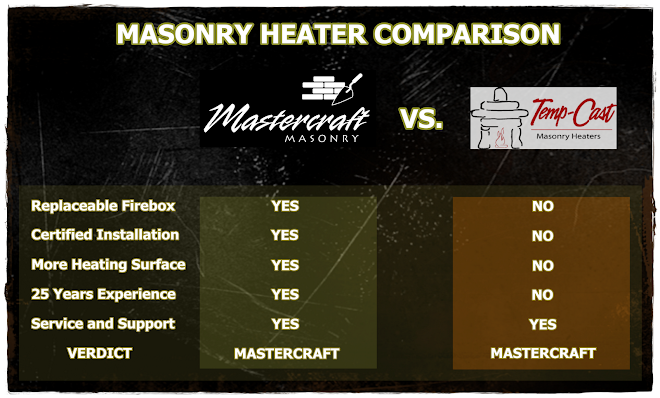 How do I get more information about Mastercraft's Masonry Heaters? Or give us a call at (360) 225-5699! The World's Most Efficient Fireplaces! Don't waste time and effort throwing wood into that empty black hole - the woodstove. 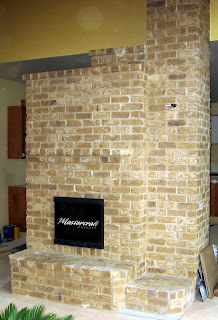 Consider building a Mastercraft Masonry Heater! These amazing fireplaces can heat your home up to 48 hours from just a two hour fire! How is that possible? The Masonry Heater uses a simple system that forces flue gases downward after it exits the firebox. This allows the masonry surrouding this contra-flow design to absorb much more heat than a traditional upward flue only. Smoke gases then exit via the chimney located off to the side. A traditional fire lasts from 2-4 hours, and most of that heat is stored in the masonry mass, and since the Masonry Heater's intense burn is much hotter than a woodstove, the exhaust particulates are greatly reduced. The Masonry Heater is then shut down after all combustion has stopped, resulting in a cozy, radiant heat located in the center of your home. Masonry Heaters require little maintenance with the proper burning of dry cordwood. A small amount of fly ash may accumulate in the channels over a year's time. This can simply be vacuumed when the unit is cold, often done when the heating season is over. Masonry Heaters can be constructed with natural (real) stone as well as brick. The fuel source these fireplaces use comes from a fully sustainable resource - wood! Contact Mastercraft Masonry today at (360) 225-5699 for more information! 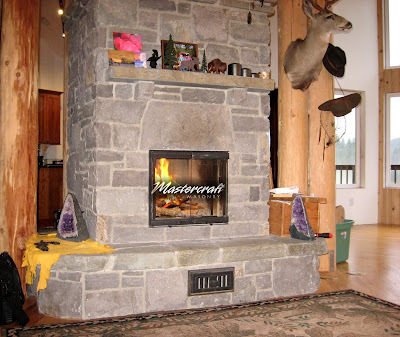 Mastercraft Masonry opened its doors for business over three decades ago, serving the Portland / Vancouver metropolitan area. Since then, we have built numerous business clients and many thrilled customers. Our commitment to quality begins with quality materials, professional conduct and exceptional knowledge about the trade. A modest sized company, Mastercraft has always held the belief that superior craftsmanship and customer satisfaction go hand in hand. Don't hesitate to call us! 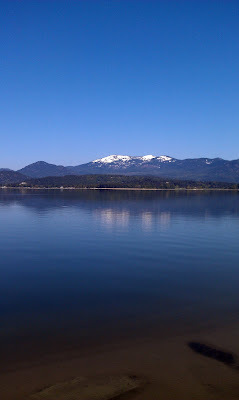 We are located in Woodland, Washington, and are fully Licensed, Bonded, & Insured in Oregon and Washington.